Control systems are all around us, and even within us. Our blood sugar level is regulated by an internal control system, as is our body temperature. Examples of external control systems include an airplane's autopilot, and even temperature-control circuits of some soldering irons. While control systems come in many forms, they are all made up of smaller building blocks with functions that are common between all systems. For example, most control systems have a "plant" that has some output to be controlled, An actuator is used to control the output of the plant. Fig. 1. Here's an example of a simple, open-loop control system. No signal comes back telling the system how well the room is being heated. A common control system is the heating system in your home. 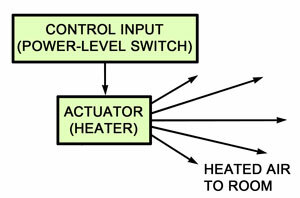 The plant is the room, the output is the room temperature, and the actuator is the furnace. Many control systems also have an output sensor that determines how well the operation of the plant is maintained, compared to some reference or command input. In our room example the output sensor is the thermostat, and the reference is the setting of the thermostat. The signal from the output sensor is used to turn on the actuator to affect the plant's output if some error exists between the pianfs output and the reference. That is called feedback � an output signal is fed back, via a sensor of some sort, to the actuator to change the output. A control system with feedback is also called a closed-loop control system. In our example, the wire going from your thermostat to your heater is half of the loop. The heated air that comes out of the basement through ventilation ducts and back to the thermostat is the other half of the closed loop. As mentioned earlier, an error signal is used to turn on the actuator. It is important to understand that the actuator is only activated if the error signal is not zero. For example, say that your thermostat is set at 68� F and your home's temperature is also 68�, but outside it is 35� and windy. Is your heater on? No, there is no error between the room temperature and the thermostat setting, so the furnace is off.